About a month ago, Jesse and Kate Watson of Nicer Foods contacted me and asked me if I’d like to test drive their newest product. Given how much I liked their last effort (chocolate peanut butter flavoured protein bars, mmmmmmmm…….) I of course said yes. Please realise, though, that the opinions here are my own; even though they very generously sent me a full-sized version of each of the four flavours, I was not bound to give them a good review. Firstly, 10 points to Gryffindor – I mean Nicer Foods – for great customer service; they have always replied promptly to my enquiries and these little beauties reached me just two days after I agreed to review them, in a well padded parcel. For the uninitiated, the low FODMAP diet restricts garlic and onion, among other foods, based on their high quantities of fermentable carbohydrates, known as fructans (or fructooligosaccharides/FOS, part of the O group), which aren’t absorbed in the small intestine, so travel on into the colon, where your resident gut flora digest them, leading to gas production, bloating, cramps and altered bowel movements. You know, exactly what you want to read about in the review of a gourmet food product. Sorry. For the less than savoury reasons mentioned above, those following the low FODMAP diet for relief of digestive complaints will eliminate garlic and onion varieties, which for some might seem like the end of the world for their taste buds. However, luckily for us, FODMAPs are water soluble, so foods like garlic and onion can be sauteed in oil until their flavours have seeped in, leaving the fructans behind. This means that oils infused with the essences of higher FODMAP foods can impart the flavour into your meals, without the FODMAPs. Sounds great and easy enough, right? Well, the down side to this is that you really shouldn’t store your homemade infused oils; you can make them but only if you plan to use them right there and then. Botulism, a potentially fatal bacterial infection, is caused by the food-borne bacterium Clostridium botulinum, which thrives in low oxygen, alkaline, warm environments – just like infused oils. Personally, I’m not happy to risk a case of Botulism to have the convenience of homemade infused oils lying around and, while I’m happy to throw a couple of garlic cloves into simmering oil when I’m cooking, I most likely won’t be bothered when I am making a heat-free-prep meal, like dips or salad dressings. So, what to do? Supermarkets and websites sell varieties of infused olive oils that we can take advantage of. But what makes Nicer Foods’ infused oils stand out from the crowd? Firstly (and most importantly), they are made with the intention of being completely FODMAP friendly, so you don’t have to worry about garlic or onion “juice” getting into the oils, like you do with others. Have you ever seen the garlic infused oils on the supermarket shelves that have bits of garlic sitting at the bottom? Chances are you may react to that particular oil – depending on how sensitive your gut is. Secondly, they taste great – more on that later – and thirdly, I’d happily support a family owned start up company over a chain-brand that probably doesn’t care as much about quality control and its customers. 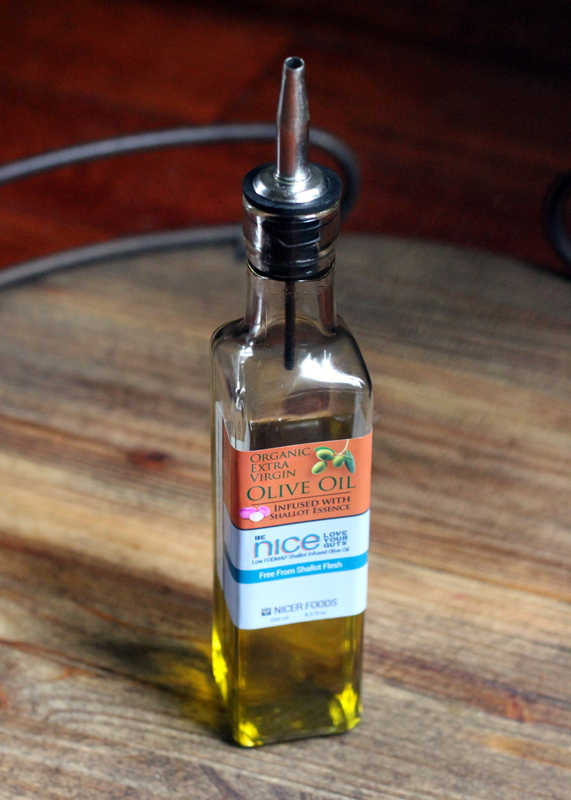 So, to the oils!… Which are available online for purchase at Nicer Foods’ website for a reasonable price. Great taste, a little strong but pleasant. It works wonders as a simple salad dressing with a pinch of sea salt or as part of a cooked meal. Just beware, though, that as it’s an “extra virgin olive oil,” (EVOO) I’d keep your heat low, so don’t use it while stir frying, or simply add it in at the end of the cooking process. Salad dressing, with a pinch of sea salt and perhaps a dash of white wine vinegar. Drizzle over your pasta of choice and throw on a few cherry tomatoes, some shredded basil and Parmesan cheese. Onion replacement in hot meals, if used carefully – would work in combination with the garlic oil in any Italian or Mexican dishes that you wanted to try, such as this Bolognese sauce. 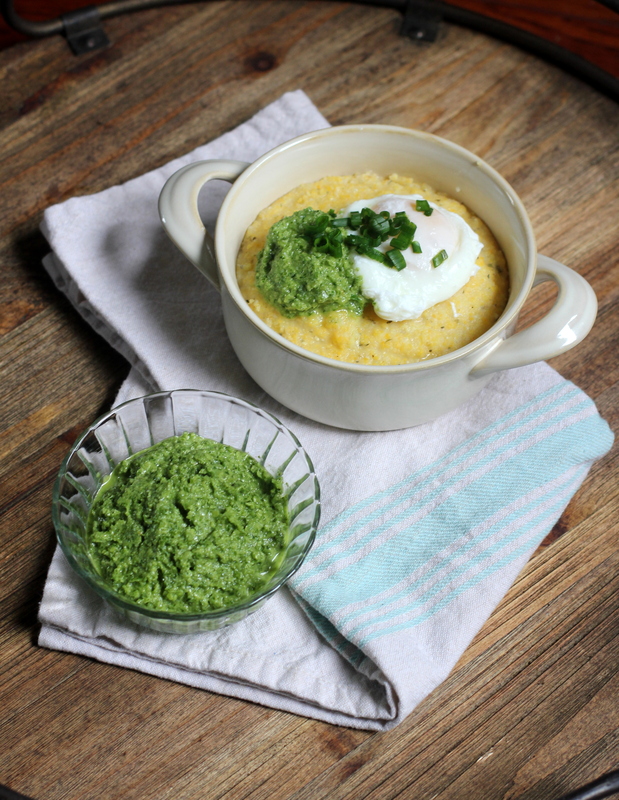 Jazz up your favourite low FODMAP dip recipes – this would go well in a roasted capsicum dip. I like the shallot oil so much that it has earnt it’s own pouring spout. If I had to pick, it’d be my favourite. A pleasant and mild garlic flavour. I’ve tried store bought garlic oils before and some have had an obnoxious garlic taste but this one, thankfully, does not. Use carefully in cooking, such as garlic free carnitas or Napoli sauce (after sauce has been reduced from the boiling point). Whip up a delicious garlic infused guacamole. Bake some spinach and Feta muffins, or mini quiches, using the garlic oil as part of the fat content, to spice up the flavour. Pictured here in a green leek chimichurri sauce. Refreshingly zingy. I like the other oils a lot, too, as the steadily emptying bottles can attest – but this one speaks to my inner baker and dessert-aholic. The flavour reminds me of a lemon biscuit (cookie) that my Gran used to buy and that I now want to replicate. I wish it came in a bigger bottle! Drizzle over seafood as it’s removed from the heat. Use it as part of a zesty summer salad dressing. Use it as part of the fat component in a lemon-infused baked goods – I’m planning a recipe right now. Herby! I love the versatility of this oil. Good quality oil – as are all the others – that can be used in a variety of ways. Make an extreme basil pesto, or add it with a bit of the garlic oil to a spinach or kale pesto for some basil flavour when basil is out of season. Drizzle it into a bowl of plain EVOO and Balsamic vinegar (which is low FODMAP in 1-2 tbsp. servings) and use it as a dip for your gluten free or FODMAP friendly bread for a simple appetiser. For a super simple lunch or dinner, drizzle some over freshly cooked gluten free pasta, add in some chopped cherry toms and sprinkle with Parmesan cheese and you’re done. All in all I can safely say that I recommend these oils. The team at Nicer Foods has done a great job. The fresh flavours, combined with no ill reactions on my behalf, and a friend’s rave review of my shallot oil/sea salt salad dressing (“That’s all that was in the dressing? !”) makes this a win-win product in my books. This entry was posted in Not A Recipe, Tips and Tricks and tagged basil oil, dessert, dinner, entree, FODMAP, FODMAPS, fructose friendly, fructose malabsorption, garlic free, garlic oil, gluten free, healthy, home-cooked, homemade, infused oils, irritable bowel syndrome, lemon oil, low FODMAP, low fodmap diet, low fructose, low sugar, onion free, onion substitute, Seattle, shallot oil, vegan, vegetarian. Bookmark the permalink.